I recently re-read a post from earlier in the year by Gavin on Makeapowerfulpoint.com …saved in my Evernote notebook. (Have I told you how much I love Evernote?!) The post asks, “which speaker type are you?” and lists 6 types of speakers, with notes on the strengths and weaknesses of each. I agree that we all have different styles. But what this mostly reminded me of is that we are playing roles all the time whether we know it or not. Have you ever heard your spouse answer the phone and say a few words to someone? After only a few words, you know exactly to whom he is speaking because he puts on his “dutiful son” voice when speaking to his mom, or his “I’m a sucker for my kid” dad-voice when speaking to your daughter? I asked one of my clients what roles she plays at work. She is a VP at a tech company and has employees all over the world. She said that she plays leader, mentor, tech support superhero, and even Mom, sometimes. Right now, it’s unconscious and simply something she can reflect on. However, she can use those roles, and others, consciously, purposefully in different places in a presentation or a conversation. First, for variety, which is more interesting to listeners. Second, for connection. They are real roles that she plays and she can use them to connect more deeply with what she is saying by finding meaning beyond the words. And finally, for authenticity. Because she really IS playing those parts, her communication will feel more authentic even though it’s also more calculated. Let’s use three of the roles that Gavin talked about as examples. What does your teacher’s voice sound like? How about your coach voice? What’s different about the two? When you teach do you sound and act like a college professor or your high school lit teacher? When you coach do you sound and act more like your tennis coach, or John Wooden (don’t you wish!?) And when you are the inventer, how is your Steve Jobs voice different from your professor’s voice? Though we may be one particular type overall, as Gavin suggests, we have multiple personalities that play out when we speak. This gives color to what we say. When working on a talk, I find it helpful to identify the different roles played within the talk and where to consciously bring them into delivery. I write them into the notes or script. Then, practicing each voice by creating an intention for each section and role makes the change from one to the other smoother. Figure out what roles you play in your life and work and begin to cultivate those “voices” as part of your toolkit for public speaking. Make the roles part of the intention you have when you communicate. Observe yourself and others in those roles, and practice hearing and using the subtle differences that communicate so loudly to others as the different personalities you are. 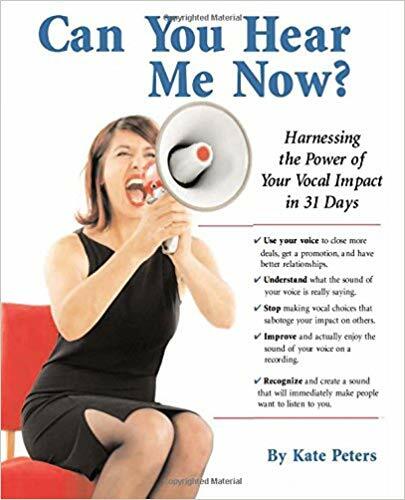 Is your tone of voice professional?